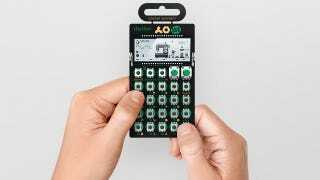 Teenage Engineering's been teasing its tiny PO-12 for nearly a year, and for the NAMM show, it's officially launching its pocket synth not as a standalone unit, but as a line of little noisemakers that look like Casio calculators with their faceplates snapped off. The new PO-12, PO-14, and PO-16 are called the "Rhythm," "Sub," and "Factory," respectively. The Factory is a lead style synth for playing melodies, the Sub is designed for making bass lines, and the Rhythm, predictably, is a drum machine. Each of the Pocket Operators has 16 different sounds, its own set of effects and filters, plus a 16-step sequencer. As for the hardware, the Pocket Operators are intentionally minimal. You might even say excessively so. They consist of the printed circuit boards without any casing around them. There's a little speaker built-in, to each, but there's also a line-in and line-out, and apparently, a jack for synchronization as well. The POs are powered by AA batteries, and have a little bent wire stand that flips out. They'll all cost $60. So how do all those words I just wrote sound? TE has been teasing the Pocket Operators for a while so there are plenty of YouTube videos of the prototypes, I'm fond of this one featuring by a very enthusiastic presenter. The new line is being launched in collaboration with Swedish clothing manufacturer Cheap Monday, in an effort, no doubt, to land them in every Urban Outfitters on Earth. In addition to selling PO-themed clothing, Cheap Monday will be selling a $40 case to carry around the Pocket Operators, which doesn't sound like a bad investment because these things are basically exposed electronic circuit boards. On the other hand, they run your total outlay to $100. It's tempting to dismiss the Pocket Operators as jokey gimmicks that could easily be replaced by an app, but that's reductive. Hardware is important. It's a challenge to build instruments with a design that invites people to want to experiment. The POs are dead simple, playful, and frankly look like a lot of fun.